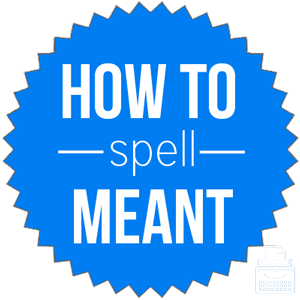 Spelling of Meant: Meant is spelled m-e-a-n-t. Definition of Meant: Meant is the past tense and participle of the verb mean. The verb mean is defined as to have in the mind as a purpose; to design for or destine to a specified purpose or future; to serve or intend to convey, show, or indicate; to have importance to the degree of; to direct to a particular individual. Pronunciation of Meant: Meant is pronounced ment. What does meant mean? Meant is the past tense and past participle form of the verb mean. Mean is the act of having a particular purpose or intention in mind, or, designing something or saying something for a specific purpose or reason or person. While meant is the past tense, though it can be used in sentences in which the future tense is used. I meant what I said yesterday. What I meant was it’s better for you if you tell her the truth. That letter was not meant for you. Before you explained the meaning, I never understood what that saying meant. This word now means something entirely different than what it meant in Shakespeare’s day. Mean business: to be serious and/or diligent. Now, people are realizing that, when he said he meant business, he wasn’t joking. Mean well: to have good intentions; try to be helpful or kind. I know her constant corrections were annoying, but she meant well. Meant is the past tense and past participle of mean. Mean was first used before the 12th century, according to Merriam-Webster’s. Mean comes from Middle English menen via Old English maenan, which is akin to Old High German meinen, meaning to have in mind. Since meant is the past participle/tense, the synonyms listed here are for the present tense, mean. However, to form the past, simply add the appropriate suffix, which is usually “-ed”. Meant is the past tense and past participle of the verb mean, which is used most commonly to denote intention, purpose, significance, or reason.